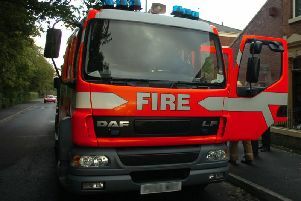 A woman rescued from a burning building over the weekend has died in hospital, Lancashire Police said. Three people, the 25-year-old woman, a 39-year-old man, and a 23-month-old girl, were treated in hospital after emergency services were called to the blaze in Rossendale, south of Burnley, at around 10.45pm on Sunday. Police said all three suffered serious injuries, including the woman who had been stabbed. She died in hospital on Thursday, police said. The man, who had been arrested on suspicion of attempted murder following the incident, remains in hospital undergoing treatment. The girl also remains in hospital. Detective Chief Inspector Mark Vaughton said: "These are tragic circumstances and my thoughts are with her family and friends. "Our inquiries continue to establish exactly what happened."